Solar photovoltaic (PV) power is a method of generating electrical power by converting solar energy radiation into direct current electrical power using semiconductors that exhibit the photovoltaic effect. Solar PV power is a renewable as well as sustainable energy source. Solar PV power is now the third most important renewable energy source after hydro and wind power in terms of globally installed capacity. Solar cells, also called photovoltaic cells by scientists, convert sun energy directly into electricity. PV gets its name from the process of converting light (photons) to electricity (voltage), which is called the ‘photovoltaic (PV) effect’. The PV effect refers to photons of light exciting electrons into a higher state of energy, allowing them to act as charge carriers for an electric current. The PV effect was first observed by Alexandre-Edmond Bequerel in 1839. The term photovoltaic denotes the unbiased operating mode of a photodiode in which current through the device is entirely due to the transduced light energy. Virtually all photovoltaic devices are some type of photodiode. The PV effect of silicon (an element found in sand) was discovered in 1954, when scientists at Bell Telephone discovered that silicon created an electric charge when exposed to sunlight. Solar energy is the most abundant energy resource on the earth. Direct conversion of sun energy into electric power in PV cells is one of the three solar active technologies. The other two technologies are ‘concentrating solar power (CSP)’ and ‘solar thermal collectors for heating and cooling (HSC)’. Today PV provides more than 0.1 % of total global energy generation. It has also promising future. Global PV capacity is increasing at an average annual growth rate of more than 40 % since 2000 and it has got significant potential for long term growth in coming years. Solar PV power is a commercially available reliable technology for power generation. Solar PV power not only contributes to significant green house gas emission reductions, but also provides benefits in terms of the security of energy supply and socio- economic development. Because of the growing demand for renewable energy sources, the manufacturing of solar cells and photovoltaic has advanced considerably in recent years. Solar cells produce direct current electricity from sun light which can be used to power equipment or to recharge a battery. The first practical application of photovoltaic was to power orbiting satellites and other spacecrafts, but today the majority of photovoltaic modules are used for grid connected power generation. In this case an inverter is used to convert the direct current (DC) to alternating current (AC). Solar panels used for generation of power are typically made from solar cells combined into modules that hold about 40 cells. Many solar panels combined together to create a system which is called a solar array. Copper solar cables connect modules (module cable), arrays (array cable), and sub-fields. A typical building will use about 10 to 20 solar panels to meet its power needs. For large electric utility or industrial applications, hundreds of solar arrays are interconnected to form a large utility scale PV system. For best performance, Solar PV panels aim to maximize the time they face the sun for higher power generation. Solar trackers achieve this by moving PV panels to follow the sun. This allows them to capture the most of the sunlight. The increase can be by as much as 20 % in winter and by as much as 50 % in summer. Static mounted systems can be optimized by analysis of the sun path. Panels are often set to latitude tilt, an angle equal to the latitude, but performance can be improved by adjusting the angle for summer season and winter season. Generally, as with other semiconductor devices, temperatures above room temperature reduce the performance of photovoltaic cells. Solar cell consists of layers of a semi conducting material. When light shines on the cell it creates an electric field across the layers, causing electricity to flow. The greater the intensity of the light the greater is the flow of electricity. However a PV system can also generate electricity on cloudy days. It does not need bright sunlight to operate. The performance of a solar cell is measured in terms of efficiency at turning sunlight into electricity. A solar PV module having an efficiency of 12.5 % means that it converts one eighth of sunlight striking the module into electricity. Photovoltaic power capacity is measured as maximum power output under standardized test conditions (STC) in ‘Wp’ (Watts peak). The actual power output at a particular point in time may be less than or greater than this standardized, or ‘rated,’ value, depending on geographical location, time of day, weather conditions, and other factors. Solar photovoltaic arrays plant load factor (PLF) is typically less than 25 %, which is lower than many other industrial sources of electricity. Traditional solar cells are made from silicon. They are usually flat plate and generally are the most efficient. Cells require protection from the environment and are usually packaged tightly behind a glass sheet. Photovoltaic technology uses the following types of solar cells. Crystalline silicon solar cell – These are the most efficient solar cells and are made from ‘solar grade silicon’. This technology was developed first and today it represents majority of applications in the solar panels. The cells are made from thin slices (wafers) cut either from a single crystal of silicon (mono crystalline silicon c-Si) or from a block of silicon crystals (poly or multi crystalline silicon poly-Si or mc- Si). Single crystal wafer cells tend to be expensive since they are cut from cylindrical ingots. They do not completely cover a square solar cell module without a substantial waste of refined silicon. Usually there are uncovered gaps at the four corners of the cells made from single crystal. Poly or multi crystalline silicon cells are made from cast square ingots which are large blocks of molten silicon carefully cooled and solidified. Poly-Si cells are less expensive to produce than single crystal silicon cells, but are less efficient. Thin film solar cell – These are second generation solar cells and are made by depositing extremely thin layers of photo sensitive materials onto a low cost backing such as glass, stainless steel or plastic. The photo sensitive materials used are amorphous silicon and non silicon materials such as cadmium telluride (Cd- Te), copper indium gallium selenide/sulphide (CIGS). Thin film solar cells use layers of semi conductor materials only a few micrometers thick. The lower production costs counter balances this technology’s lower efficiency. They have become popular compared to wafer silicon due to lower costs and advantages including flexibility, lighter weights, and ease of integration. A typical thin film manufacturing process include (i) coating of the substrate with a transparent conducting layer, (ii) depositing of the active layer by various techniques such as chemical/physical vapour deposition, (iii) back side metallization (contacts) using laser scribing or traditional screen printing, and (iv) encapsulation in a glass polymer casing. Roll to roll techniques are often used with flexible substrates to reduce production time and costs. Other cell types – Several other types of PV technologies are being developed today or starting to be commercialized. These are third generation solar cells which are being made from variety of new materials including solar inks using conventional printing press technologies, solar dyes and conductive plastics. Some new solar cells use plastic lenses or mirrors to concentrate sunlight onto a very small piece of high efficiency PV material. The PV material is more expensive, but because so little is needed, these systems are becoming cost effective for use by utilities and industry. However, since the lenses must be pointed at the sun, the use of concentrating collectors is limited to those parts which are sunniest. The conversion efficiency of different technologies is given in Tab 1. The life of a Solar PV cell is 25 years. However its efficiency and hence power generation deteriorates with time. The deterioration is 10 % in first ten years and another 10 % in next 15 years. Solar PV systems can be installed on roof tops or can be ground mounted. These can be grid connected power plants or can be off grid systems. Connection to the grid allows excess power produced to be transferred to the grid and import power when power is not generated because there is no sun. Off grid systems bring electricity to remote areas. Off grid systems can also be used for rural electrifications. Solar PV can also be used for consumer goods. 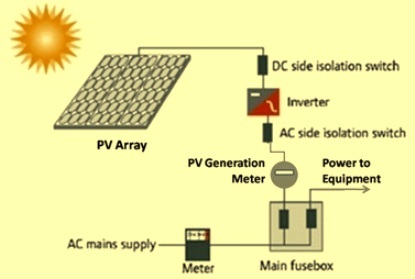 Schematics of a solar PV plant is shown in Fig 1. Sunlight reaching the earth’s surface is plentiful and has potential of becoming the world’s primary energy source. Solar power is pollution free during use. PV installations have long life with very little maintenance. Operating costs of the PV installations are extremely low. Grid connected solar electricity can be used locally thus reducing transmission/distribution losses. The initial investment is high. The maximum plant size for grid connected power plant is limited to 10 MW.